Who knew, right?? This is definitely how I'll be handling all of my dough from now on! WOW! 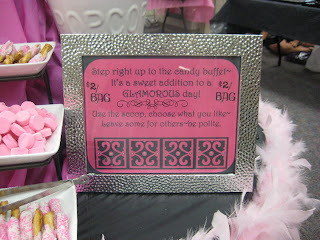 I've been awful about keeping up with this blog lately - so I am going to do a catching-up post. I've had a few orders since the last post and I'm still having a blast! Things have really taken off which is great! These cookies were so fun to make. They were for the granddaughter of a lady I work with, it was her 2nd birthday! 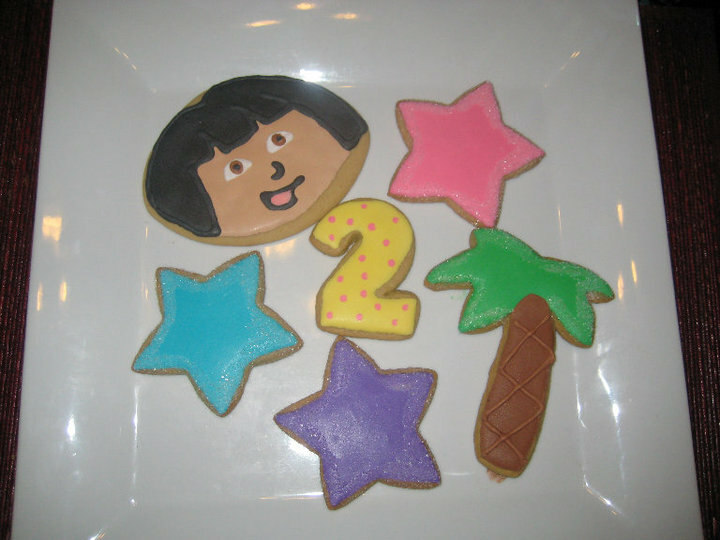 I was pretty pleased with how these turned out, though I didn't realize what a challenge Dora was going to be! For the "sparkly" palm trees and stars I used meringue powder mixed with water as the glue and sprinkled sanding sugar around the edges. I thought it gave them a very fun effect! 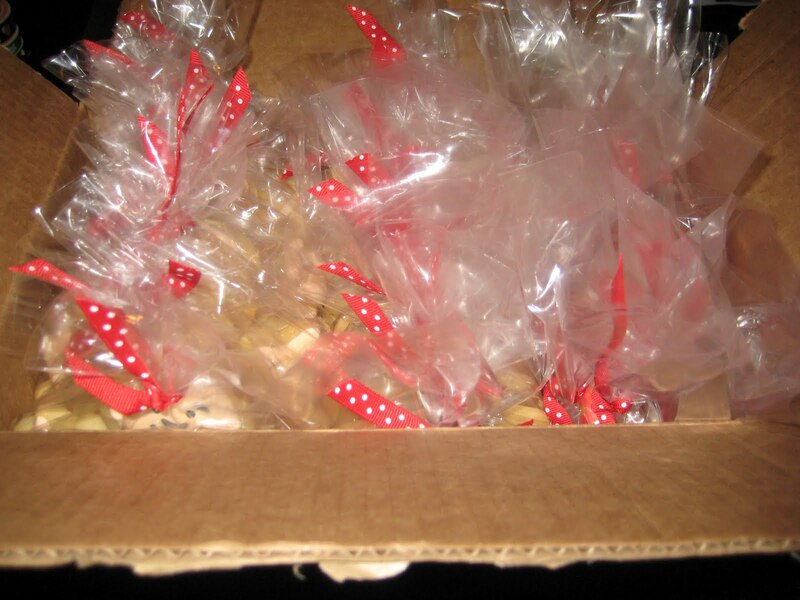 A friend of mine had a coworker that was getting married and they were having a little office party for her and she asked if I would make some cute Bridal Shower cookies for this special event! She just wanted simplicity, so what's more simple than pretty white wedding dresses? 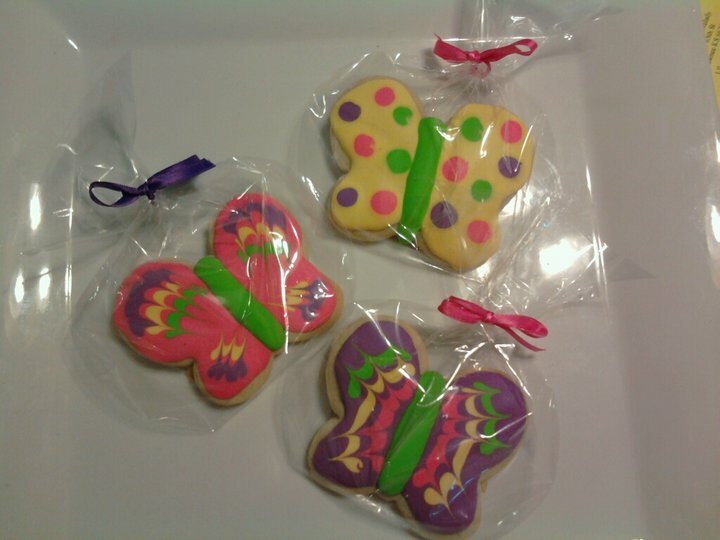 I think they turned out beautiful! 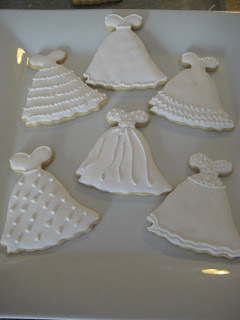 I had extra dough after making the wedding dresses and decided to make some special cookies for my Mom. She's a super special lady and only deserves super special cookies! 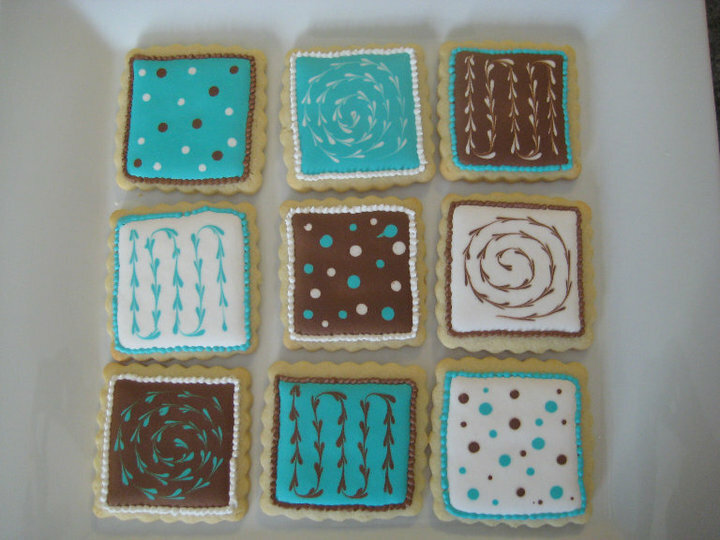 These just might be some of my favorite cookies I've done so far, the different colors and patterns were so pretty together and the simplicity of the square kept them looking uniform. 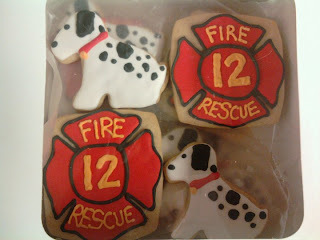 I will definitely make these again sometime! Thanks to some kind words & a referral from a friend of mine at work, I had the opportunity to be part of a super-fun day for little girls this past weekend. It was an event called "2 Glam 4 School" and it was a day for girls to come get their toenails painted with pretty flowers, their hair braided, pictures taken and to enjoy some yummy treats! 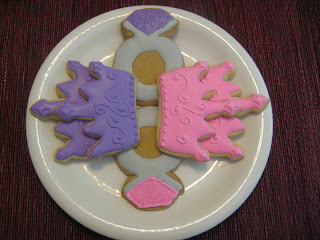 Luckily some of those yummy treats were my princess cookies! 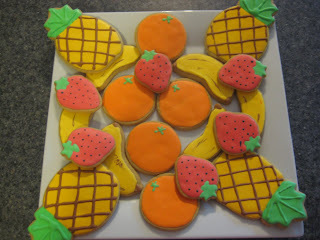 I wanted to be sure to showcase both of my popular sugar cookie flavors - lemon and regular. 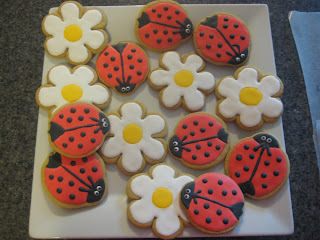 I also wanted to make the cookies super cute and girly so all of the little girls would be excited when they saw them. 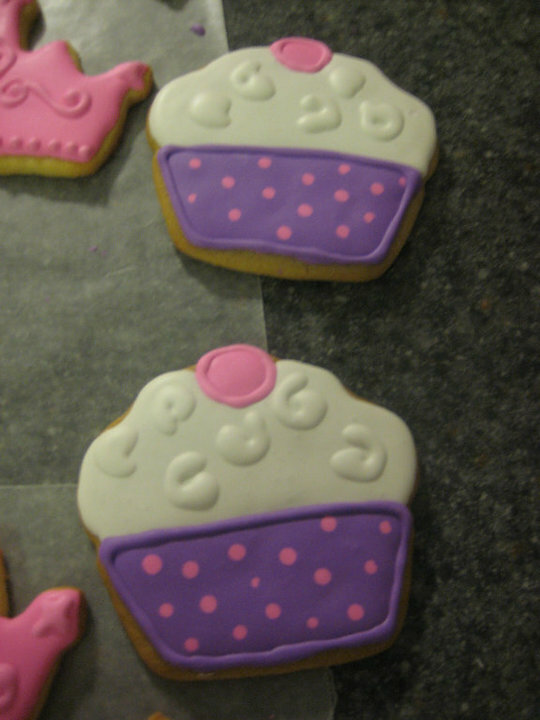 The pink icing turned out super cute, I loved how bright it was! 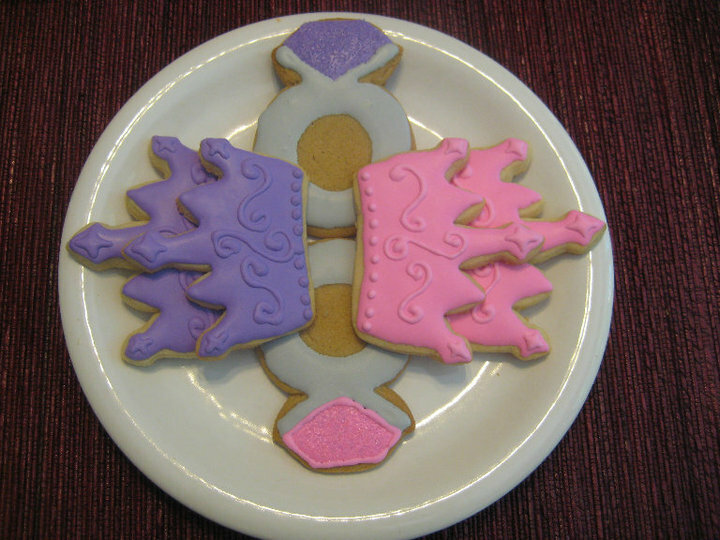 Since I was having to make so many I tried to keep the design of both the ring and crown pretty simple. Curious what the favorite was? 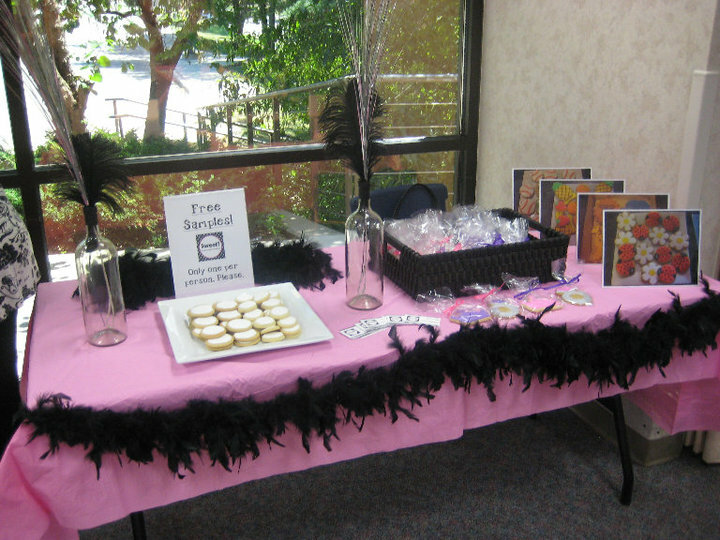 The Pink Crowns :) ... they went fast! 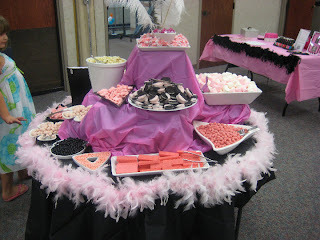 The entire room was full of pink, black, feathers and sparkles...including my table. Don't you just love it? I had the 2 wine bottles with feathers & silver spray decorations leftover from our New Years bash last year. They worked perfectly! I had an absolute blast getting to spend some time with the sweetest little girls while showing off my newborn business venture. I was lucky enough to have some of the Mom's take my card and insist that they would be calling me ASAP to get something set up! Woohoo! 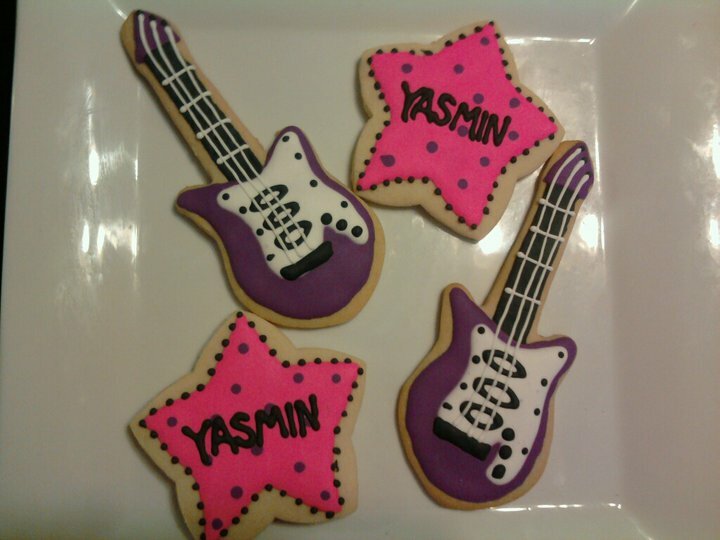 I will definitely be making a bunch of these very soon! I can't wait to use all kinds of fun colors & make all sorts of different cupcakes! 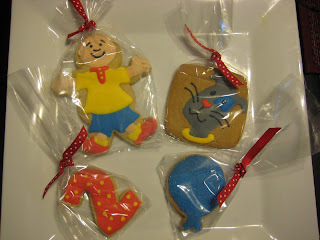 Well that's all for now...Dora Cookies up this week - pictures to come! Since I have started getting more and more orders for my sugar cookies (SO exciting!! ), I decided that I should probably create some sort of a brand name and logo. I like to consider myself a decently creative person - I mean I'm a dancer, I decorate cookies & love taking photographs (maybe another blog idea??...hmm...) 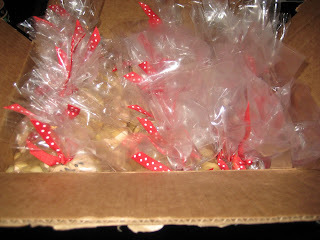 - so why did I have such a hard time thinking of a fun and catchy name for my cookie business? Let me know when you think of an answer....because I don't have one. 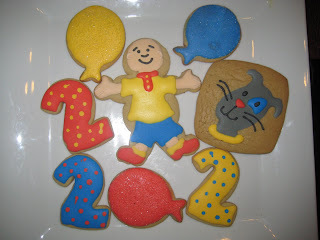 These cookies were delicious and quite the hit at both birthday parties! I was very proud to show them off!